Uncapped Gabriel Agbonlahor stayed in Fabio Capello's first England squad for Wednesday's friendly with Switzerland after the 30-man party became 23. Striker Emile Heskey had to withdraw after earlier suffering a nerve problem in Wigan's 1-0 win over West Ham and Ledley King is also unfit to feature. Stewart Downing and Michael Carrick were among the five players dropped, along with the uncapped Curtis Davies. Nicky Shorey and Glenn Johnson are the others who have missed the cut. David Beckham was left out of the initial squad, leaving him stuck on 99 international appearances, because of doubts over his match fitness. Capello, who also omitted Tottenham goalkeeper Paul Robinson, said: "I want to be clear that the players who have not made the squad this time are still part of my plans. "We will be monitoring the form of everyone very closely as we work towards the competitive matches which start in September. "It is of course a blow to lose Ledley King from the squad. He is a very good player who has impressed me a lot when I have seen him play. "I am fully aware of his injury status after speaking with Juande Ramos on Friday. "Emile Heskey's injury is disappointing too, but we have to concentrate on the players who are in the squad." 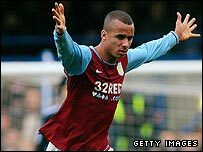 Villa striker Agbonlahor, 21, is one of only four forwards in the squad, so stands a reasonable chance of making his debut on Wednesday. What do you think of the 23-man England squad? His club-mate Ashley Young could also feature at some stage, to earn only his second cap. Capello revealed he will announce his choice for captain on Tuesday but added: "I don't expect to appoint a permanent captain until we start the qualifying games. "I want to work closely with the players before deciding on this. "I'm looking forward to working with them on the training ground. There is a lot of work to do but I am ready for the challenge. "We have seven months to prepare for our first competitive match, but the work really starts now." The England squad will gather on Sunday afternoon at the team hotel in Watford.